William Henry Walsh was born September 8, 1927 in Phillipsburg. He was one of two boys born to Ruth and Scotty Walsh. He and his brother Jim were fine athletes who excelled in baseball, football and basketball. Bill enrolled at Phillipsburg High School in 1941 and became a key figure in the school’s longtime sports rivalry with Easton High across the Delaware, in Pennsylvania. At 6'2" and 200 pounds, he was a formidable blocker and tackler. Bill was the star of the Phillipsburg High School football squad in the early 1940s. During his three seasons as a starter, the team lost only two games. He arrived at Notre Dame in 1945 with much fanfare, as freshmen were allowed to join the varsity because of wartime manpower shortages. He immediately became the starter and in four years he helped the Fighting Irish win a pair of national championships while never missing a game. Notre Dame went undefeated in his final three seasons. 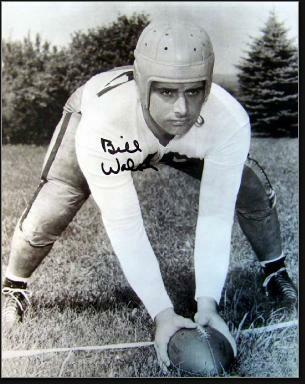 Bill was selected by the Pittsburgh Steelers with the third pick in the 1949 NFL Draft. The Steelers ran the old single-wing offense, which was highly dependent on a mobile center. Bill earned All-Pro recognition in his second year, and was selected to play in two Pro Bowls during his six years with the Steelers. In his late 20s, he began thinking about a post-career job in football. When the opportunity presented itself in 1955, he left the NFL at age 27, still at the top of his game. Bill returned to Notre Dame, where he coached the offensive line under Terry Brennan and Joe Kuharich for four seasons. In Bill’s four seasons at South bend, the Irish had one Heisman Trophy winner (Paul Hornung) and two other finalists (Nick Pietrosante and Monty Stickles). After a year at Kansas State, Bill took his act to the new American Football League, where he joined Hank Stram’s staff with the Dallas Texans and stayed on when the team moved to Kansas City in 1963. Stram had coached briefly at Notre Dame, where he and Bill had developed a mutual respect. Between 1960 and 1974, Bill developed three First-Team All-Pros, Jim Tyrer, Ed Budde and E.J. Holub. The team went to the playoffs five times during that time, and won the AFL title in 1962 and Super Bowl IV in 1969. He was known as a hands-on technician who could convey the tricks of the trade quickly and clearly to his charges, and took special pride in his ability to turn so-so blockers into solid, reliable linemen. Bill finished his coaching career with the Falcons, Oilers and Eagles, retiring after the 1991 season. Among his players during this time were Jeff Van Note and Mike Kenn in Atlanta, and Mike Munchak and Bruce Mathews in Houston. In Philadelphia, Bill inherited what was statistically the most porous offensive line in NFL history. Within two seasons he cut their sacks by more than half. Bill retired to his home in Atlanta with his wife, Shirley, after 37 years as a college and pro coach. He passed away in Atlanta on May 13, 2012.